The City of San Diego currently has 72.3 miles of Class I bike paths, including the Bayshore Bikeway. The updated plan proposes 94.1 miles. Last Monday, the update to the 2002 Bicycle Master Plan passed with unanimous support from the City Council. This plan to build an additional 595 miles of bicycle facilities nearly doubles the city’s existing 510 miles* of facilities and further demonstrated our council’s growing commitment to bicycling. During public comment, two of our proposed requests were included in the motion made by Council Member (and current mayoral candidate) David Alvarez and amended by Council Member Sherri Lightner. 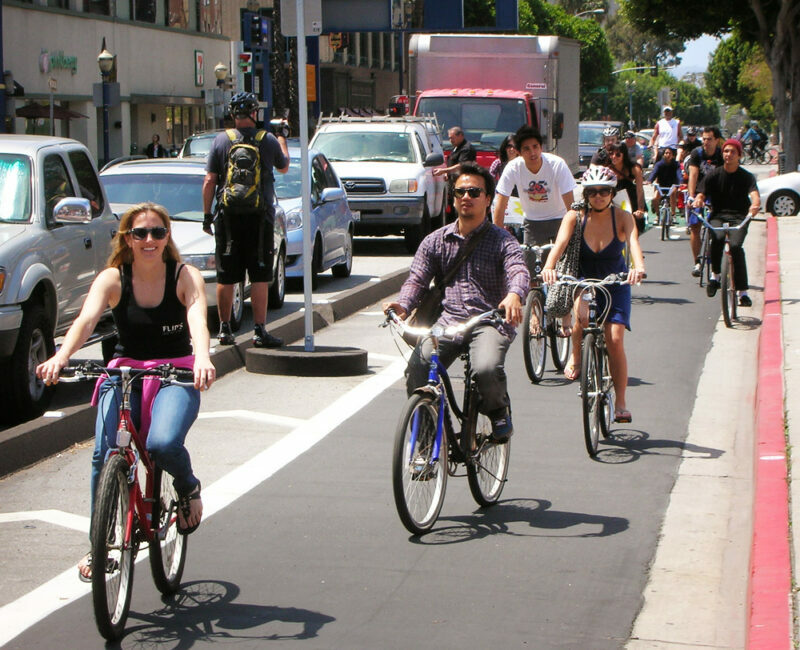 Our request to create a Bicycle Advisory Committee to ensure the implementation of the plan was also supported by the San Diego County Bicycle Coalition (SDCBC). Our request to remove the Coastal Rail Trail alignments from Rose and Roselle Canyons was not supported by the SDCBC but was supported by the community that this alignment affected: the Friends of Rose Canyon, the University Community Planning Group and Council Member Lightner whose district includes University City. Council Member Lightner spoke to not only preserving the city’s limited remaining open space but to also saving the city the huge financial and environmental expenses of building in Rose and Roselle Canyons – an amendment that was accepted by Alvarez and the rest of the council. 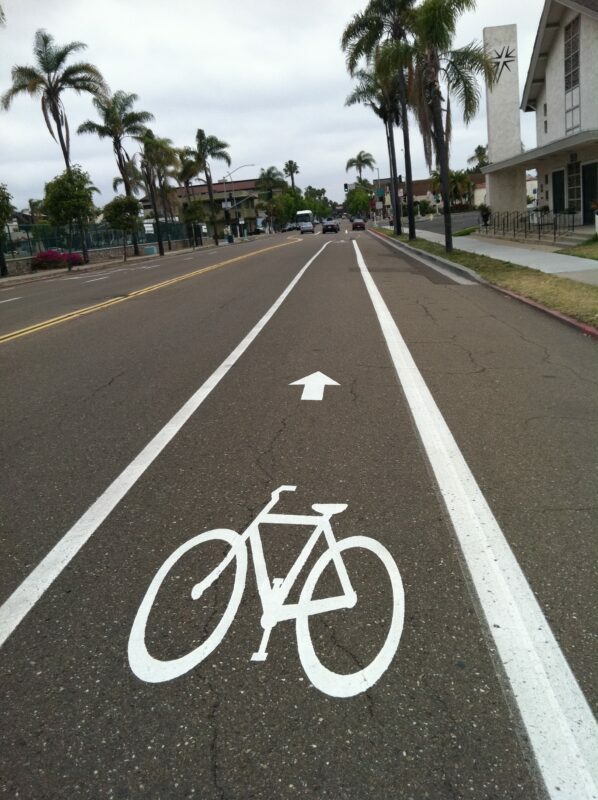 The City of San Diego currently has 209.4 miles of Class II bike lanes. The updated plan proposes 140.6 miles. Since 2002, most of the facilities built have been incredible and award-winning (such as the bike path around Lake Murray and Miramar Reservoir), but not effective in meeting the needs of everyday San Diegans by connecting neighborhoods to ensure daily riding in a way that is safe and comfortable. In the two years since the plan was updated, the plan went through respectable community feedback and input. Is the plan the best that it can be for current and future riders? The plan is incredibly promising and it should give everyone cause to celebrate. But a good plan alone will not transform our city. The important lesson from the last Monday’s vote is that the political will is unanimous and the way forward is to ensure that this plan actually gets implemented with the efforts of a Bicycle Advisory Committee. The City of San Diego currently has 112.9 miles of Class III bike routes. The updated plan proposes 171.2 miles. What will this committee do and who will it be composed of? That depends on what the City Attorney proposes to the City Council, but we’d like to have council staff, city staff, advocates and community members (including high school and college students) be active representatives. This committee will ensure that facilities get built and that the group doesn’t become yet another layer of bureaucracy inhibiting the implementation of the bicycle plan. We’d like to see all facilities implemented with complete transparency. In this year alone, our council members have demonstrated incredible leadership. Interim Mayor Todd Gloria was the first to lead on the issue. Gloria has been very receptive to feedback, ideas, and has demonstrated a willingness to lead in a way that has not been seen before in San Diego. Council member and Land Use and Housing Chair Lorie Zapf’s Council Resolution has provided us with much needed leverage to ensure accountability from the city staff in implementing bicycle infrastructure in the city. We have also learned how to listen to communities (such as the Friends of Rose Canyon) that seek us out and explain their concerns. Our success in transforming this city into a world-class city for bicycling depends on meeting the needs of our current ridership and being open and receptive to the feedback we receive from potential riders. The next steps are not only to create the Bicycle Advisory Committee, but also to ensure that the plan is implemented. How will that happen? That will be the work for BikeSD’s second year. Thank you for joining us on the ride. 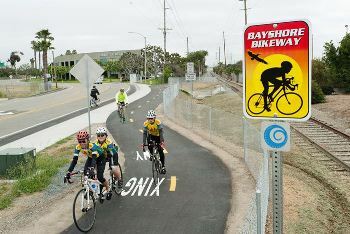 I believe that the picture of the Bay Shore Bikeway is a location in Chula Vista. Aside from hometown boosterism, if the 72.3 mi of Class I bike path includes portions in other municipalities, other claimants might assert that that’s enough when in fact it’s not. To give San Diego City it’s due: I noticed that the newly repaved section of Harbor Blvd between the ship yard and Navy base has a buffered bike lane. Really smooth asphalt, too. yes ronh, i noticed the newish pavement on Harbor near the shipyard. That has been a long time coming. Used to commute through the area and it was really difficult…still some sections to be done but much safer now. Sounds like good news. I’ll gladly take any improvements, extra signage, traffic calming, dedicated paths, et al. Now, if only the city would go after nearly every single cyclist, and I mean 99%, who routinely runs every stop sign in town, and ticketed them, and applied all of the DMV and California Code statutes for fines and DMV points on their licenses for running a stop sign with a moving vehicle, well, we might not only get somewhere, but the billions in revenue from all the tickets would help pay for way more than 170 miles of bike paths. Better off going after all those drivers who illegally double-park, use cell phones while driving, driving drunk, not coming to a complete stop at stop signs, etc.. than cyclists who wouldn’t have enough money to pay a fine—that costs almost as much as their bike cost—for breaking a law that doesn’t apply to them. Where did you get your 99% statistic? Your statement is vague. Does it mean that you want the city to cite 99% of cyclists who run stop signs, or are you asserting that 99% of cyclists run stop signs, or that somehow there is a group of cyclists who know where every stop sign in town is and routinely visits each of them with the intent of running them without stopping? I know, don’t feed the trolls. 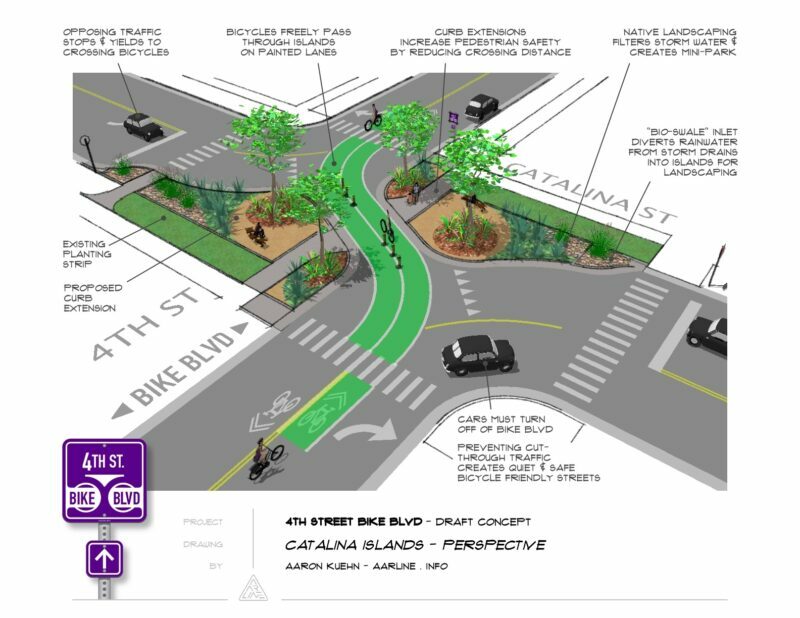 I can’t tell from the article if the rose canyon bike path will be extended and the previously proposed bike path parallel to Santa Fe Street is till going to happen? Yes, the bike path (it’s actually a cycletrack) along Santa Fe connecting to Rose Creek is still happening.